Uttarakhand has enriched natural scenery and is a famous pilgrim destination in India. If you keep religious trust, you may wish to visit the divine places and there is rich expanse of endless natural beauty. If your trust is in god and his powers to inspire you to live a complete life in an inspiring manner that is given by Uttarakhand is the great destination. Dehradun, is a capital of Uttarakhand, an exciting picturesque of River Ganges with Himalayan series in view and Yamuna river on any city side. The natural beauty, is famous for the impressive architectural scene with typical attractions such as Tapovan, Robber’s Cave, Sahastradhara, Tiger falls and more. Nanital popularly called as Lake District of India offers a scenic delight that captivates everyone. Nanital is where you requires to be for the rendezvous with nature. The Nainital important tourist attractions include – Naini Lake, Eco Cave gardens, Naina Peak, Nainital Zoo, Himalaya View point, Snow View, Horse Riding, Lands End etc. Mussoorie is popularly called as the Lake District of India, a scenic charm, situated around the popular Naini Lake, Eco Cave Gardens, Naina Peak, Thandi Sadak, Snow View, Sonandi Wildlife Sanctuary etc. Rafting, camping, trekking entice lovers, the tranquillity of place is an important religious center. Rishikesh is known as a Yoga Capital of the world with Triveni Ghat, Laxman Jhula, Ram Jhula, Bharat Mandir, Paddle India, Gita Bhavan, Kaudiyala, Narendar Nagar and Parmarth Niketen. Haridwar, the Gateway of Lord a place of several temples and asharms. 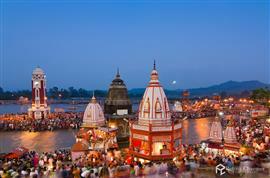 The worth visiting places are Har ki Pauri, Shanti Gunj, Maya Devi mandir, Mansa devi temple, Chandi devi temple etc.